The Draped Bust theme was first used on United States coinage in 1795. It was the famous portrait painter Gilbert Stuart who sketched the initial design, later to engraved by Robert Scot. Stuart’s model for Lady Liberty was a well known 31-year old Philadelphia woman named Ann Willing Bingham. The Mint paid artist John Eckstein $30 to translate Stuart’s sketches into workable drawings for Scot. Eckstein is most likely responsible for the small eagle reverse. As one might expect with an early date United States coin, the 1796 Draped Bust Small Eagle Silver Dollar is very rare, and there are just not nearly enough of them to go around to satisfy collectors. There are several varieties of the 1796 silver dollar. You can buy any of them with great confidence in continued value appreciation. 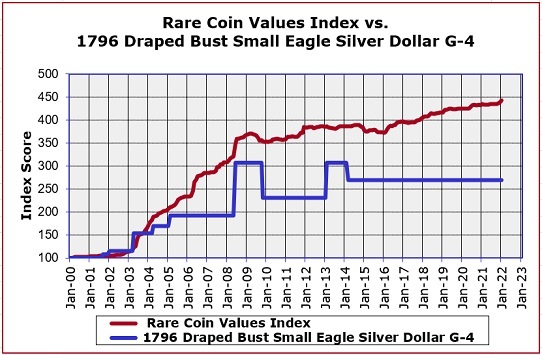 The blue line above charts the percent increase in value of the 1796 Draped Bust Small Eagle Silver Dollar since Year 2000. The red line does the same for our Rare Coin Values Index, which is based on the performance of 87 rare US coins, which were selected to represent the spectrum of scarce United States coins. The objective of the Index is to get a feel for the overall direction of the rare US coin market. As you can see, the 1796 silver dollar has increased in value at a rate a little under the overall Index. The 1796 silver dollar is one of the coins included in the Index. Every month, Index ratings are updated.